LUMPENPROLETARIAT—Workers of the world, unite! 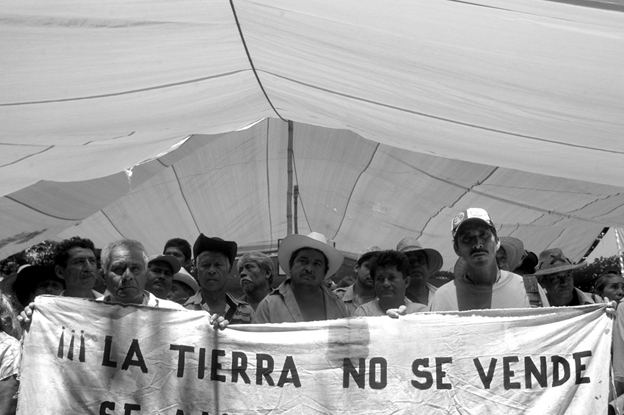 In May 2010, a group of ten labor educators, students, and activists spent four days in Cananea, Sonora to investigate the issues involved in a three‐year strike of copper miners against the multi‐national corporation, Grupo Mexico, which operates the Cananea mine. The tour was organized through the United Association of Labor Education (UALE) which had passed a solidarity resolution supporting the struggle of the miners and their families at its March 2010 Annual Meeting in San Diego. The Cananea chapter of the Women’s Front in Struggle for Worker Dignity in Mexico and the World, an organization of the Mexican Miners Union, hosted our delegation. The leaders of Section 65 of the National Union of Mine and Metal Workers of the Mexican Republic (SNTMMSRM), generally known as Los Mineros, welcomed us and met with us on several occasions. The delegation included four students, two filmmakers, a union political director, three labor studies professors, and a health, safety and environmental specialist. We wanted to find out how labor & community were faring in this 3‐year attack on the copper miners and their union, Los Mineros. Were workers still standing strong? How were families managing without paychecks? How were communities and the city affected by the actions of Grupo Mexico? Was there a viable place for outside assistance and solidarity? This Report is our overall response to what we saw and learned. We wrote it for workers, unions and communities that need to understand that in a global labor market, an injury to one is an injury to all! Our hosts, the Women’s Front, led by Maria Rosa Guayante Garcia, a large coalition of miners’ wives, sisters and family members, arranged for housing in their homes, most of our meals, and served as our guides, along with the leadership of District 65 of the Union. In a frenetic 3‐day period, we learned the history of the struggle at Cananea; investigated first‐hand the conditions in the mine; and experienced first‐hand some of the heartless maneuvers of Grupo Mexico. Water in homes was shut down for most of the day. Electricity went on and off. Clouds of polluted mine tailings followed us everywhere. We talked to top union leaders as well as rank and file picketers. We met with the mayor of Cananea, the lead doctor at the Ronquillo hospital, a teacher from the public schools, an injured miner, and local historians. Secretary General of District 65, Sergio Tolano and strike leader Jesus Verdugo accompanied us on a 3‐hour walk through the mine. Learn more at the University of Missouri’s Institute for Labor Studies or at the University of Minnesota’s Media Mill. YOUNGIST—As I was walking into the university in Bogotá, Colombia, where I work as an English Language Assistant, I saw twenty students gathered around big white posters discussing what to write in the thirty minutes they had left of their lunch break. I caught a glimpse of one of their boards and read, “No queremos los gringos aqui,” meaning, “We don’t want the Americans here.” In this instance, I was happy that my brown skin did not automatically identify me as a “gringo,” a term usually used in Latin America to refer to white Americans. I heard that farmer protests had started a week before, on August 20. Blockades, food shortages, and sometimes violent protests erupted on the outskirts of Bogotá as many local farmers were on strike. But, as I had not seen these protests in the streets of Bogotá where I live, I did not really understand what was going on. The paro, or strike, began in large part due to the Tratado de Libre Comercio (TLC) – the Free Trade Agreement (FTA) – and his question implied that the two were intimately related. As the American working at and being paid by the university, and by both the Colombian and U.S. governments, he (rightfully) expected me to know about my countries’ policies and have an opinion about it, but embarrassingly, I had no idea how to respond. Learn more at The Youngist.